All of these stats for the Cy Young and Green Jacket are at the end of the games on December 31st, 2008. Hopefully, I'll be more diligent and do this on a monthly basis. CY YOUNG AWARD: Biggest Difference Between Goals and Assists: Things seem to be settling down with the Cy Young Race, but there's still plenty of guys out there who could be contending for it with Thomas Vanek still in the lead. GREEN JACKET AWARD: Worst Plus/Minus Ranking: Rod Brind'Amour still leads this race to craptasticness, while three defensemen are in the Top (or Bottom) Five in this category. With the holiday season going on and not too much news going on-- it's time to see if I can get something to click....which will either be forgotten about or fail miserably. It's the journey that's always fun, though the result is one that may not be the one desired. Basically, from time to time; I'll do the Armchair GM bit to see what I would have done in different situations or what I could be hoping for in terms of what's ahead. It's looking more and more like the latter will come from it, but let's do it anyway. So, the Ottawa Senators are going through horror right now. It really stinks, because they're one of my favorite teams, though they are reverting back to when Norm Maciver, Jamie Baker, and Sylvain Turgeon were the top line. In fact, many would argue that the Pizza Line is acting that way right now with their lack of production together. The defense that once was one of the stingiest in the league is now looking like Swiss cheese. The only saving grace has been Filip Kuba and the goaltending, which, if you have followed the Sens and their goalie situation.....yeah, not good. What can you do now if you're the Senators?? You have to wonder if you need to trade someone and shake up some things. Maybe get rid of some defensemen and bring up youngsters like Brian Lee and extended stay in Canada's capital. See what you could possible get for guys like Antoine Vermette, Mike Fisher, or Chris Kelly to get some early rebuiling. Worst case scenario, see if Jason Spezza wants out or shop him around. Odds are they'll get Milbury'd in the deal, but it could be a light under the fire of everyone and show that no one is safe and they need to produce to stay on the team. For a team with plenty of promise and so much potential, it's just hard to see where it all went wrong. Sure, the lack of secondary scoring is very prominent, but with the potential of guys like Vermette and Kelly-- you'd expect something more than the effort that has been put forth. Though, with all the money put to the big three, it would be hard to get another top-six forward for the price of peanuts. If the Senators want to be the team pundits thought they could be, something needs to be done now before it's too late for them. If not for the present, definitely for the future. There's only so many coaches that the team can go through before it's the player's fault due to lack of chemistry. At that point, you have to blow it up for the sake of the success. Is Hollywood Good For The NHL?? 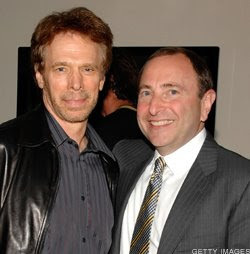 Big time producer Jerry Bruckheimer has been long linked to becoming an owner in the NHL, whether through expansion to a team in Las Vegas or through purchasing an existing team. This link has been strengthened by the Scott Burnside article about the Phoenix Coyotes being in very deep financial trouble-- to the point where the NHL is contacting prospective owners to gauge interest on whether they would want to purchase the team. However, while Bruckheimer would be a solid financial addition to the NHL ownership cartel, would he be good for the league?? The only reason I bring this up is due to the sideshow that has become the Tampa Bay Lightning after they were sold to another Hollywood producer, Oren Koules. I'm not saying that it would happen with Bruckheimer, but I've become very suspect when it comes to Hollywood actors or big name celebrities playing a big role in an ownership role. It's not right to judge one from another, but when you have an owner hawking his wears on the equipment of his players and going all out to get a bunch of press for all the wrong reasons, as it turns out, then you're going to have people who would be skeptical about having someone of the same ilk come in and take a franchise over in fear that history could repeat itself. The last thing we need to to have "CSI: Phoenix" come out because of Bruckheimer buying the team or even jumbotron vingettes of David Caruso one-liners when describing the team. It could be something that's completely different though. Should Bruckheimer buy the Coyotes, he could be a silent partner and just put front the money to the hockey people and be there in name only and not by interaction. Maybe it could be the best for stability to have someone like Bruckheimer's name and money in place in Phoenix to let the fanbase there know that they are serious about fielding a competitive team and making the team competitive in the Phoenix area and nowhere else. That's why someone like Jim Balsillie is probably out of the running for this club. It'll be a while before we know the fate of the Phoenix Coyotes, though it looks like it could come sooner rather than later. At least, we know that the NHL wants to keep it in Phoenix, regardless of the red-ink that is surrounding the franchise. Interesting, though, that a team named after a predatory animals is the one who is limping by day-by-day. The Fresno Falcons of the ECHL announced yesterday that the team had ceased operations for the season and had their membership terminated. 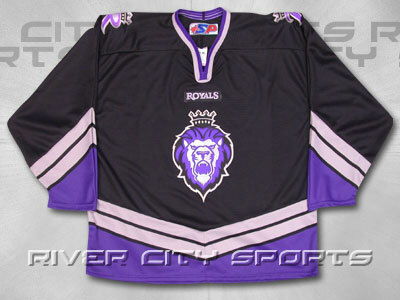 This is the second ECHL team in a month to cease operations, as the Augusta Lynx left the league on December 2nd. You have wonder how many teams will have the same fate for the rest of the year and during the off-season. While the ECHL is the "premier AA hockey league", according to their website, they also have the most travel of all the minor leagues. With teams spread from Alaska to Florida, as well as taking into account the craptasticness the economy has become, it may be time for the ECHL to split for the survival of the teams still around and wallets of the ownership groups. The current ECHL came when the WCHL and ECHL merged into one big conglomerated minor league. Hindsight being as it is, it looks like it could have been the dumbest idea they could have had at the time. The pure logistics of the entire thing, especially when you have a team in a remote place like Alaska, seemed flawed from the start. 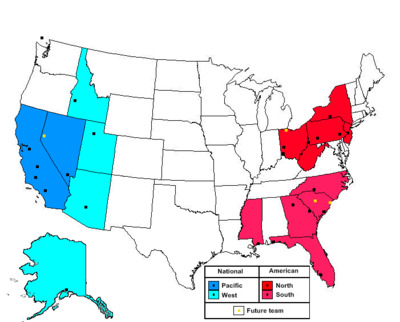 As it stands, the ECHL has nine teams West of the Mississippi and 11 teams East of it. The Toledo Walleyes will start next season upping that total to 12, while the Columbia Inferno, a yet unnamed club in Myrtle Beach, South Carolina, and another unnamed club in Reno, Nevada awaits completion of new arenas-- which would bring the total to 14 teams East and 10 West. Why not split it up again?? Make it like MLB where the two leagues play a regular season then the best from each side play for the Kelly Cup. It seems like a more logical and cost cutting measure to ensure that you don't have teams dropping out mid-season like it seems to be going on right now. Not only does it cause havoc for fans of the teams who drop out, but the schedule makers and more over the players-- who have their playing future in the hands of other GMs who may or may not need them on their team. It's a major blow to players who may be on the fringe as it is right now, their last game could have been their last game ever. But, I'll touch back on the fans-- how do fans go about the demise of their team mid-season?? Especially in the Falcons case, as well as the case of the Columbus Stars in the UHL back in 2003-04 season, where the team was in first place in their division before folding up shop. With high hopes for the rest of the season, to have the carpet pulled out from underneath them like that is probably like a permanent kick to the groin. Especially not knowing if this is just until the owners recoop the losses (somewhat unlikely) or if this is until a new ownership can come in and either resurrect the team or get an expansion franchise. It's tough to support your local hockey team when the money to do so may not be there, but if you have the chance, you definitely should. You never know when they could be take away from the area like they have been in Augusta and Fresno. A big blow was dealt to the Columbus Blue Jackets and truly opened up the Calder Trophy race, as Derick Brassard dislocated his right shoulder and is to have surgery which will keep him out for the rest of the season. Brassard was huge for the Jackets and truly shown through as a top-line center, but because of a scuffle-- his shoulder has been injured again and he's out for the season. First off, you have to wonder about Brassard's durability. This is his second serious shoulder injuries for Brassard, which has wreck his big chances to shine on the big club. Brassard could be considered a liability now and the Jackets could wonder if he can sustain a full year without getting injured. Though, you look at his teammate, Rick Nash, another young guy who was hampered with injuries in his early years and he's now the franchise guy for the Jackets. Maybe lightning can strike twice, and I'm sure the Jackets' brass is hoping the same thing. Secondly, the Jackets don't have much for scoring talent down the middle. With the loss of Brassard; that eliminated the only scoring talent at center for the Jackets. The Jackets have been looking for a center for the longest time and thought they could have it in Brassard, yet now here we are-- no contingency plan in place. So, on top of a right-handed shooting defenseman, they still need to search for that elusive center. Third, you have to say with Brassard out-- this opens the door for Steve Mason to shine, not only on the Jackets, but for the Calder Trophy race. Also, for guys like Kris Veersteg, Patrik Berglund, and Blake Wheeler-- it's a huge chance for them to step up and keep on shining through and step up in order to not only make a name for themselves, but they will be a big part of their respective teams' success down the line. While Brassard wasn't the runaway favorite; he was a big favorite after his performance for the first quarter of the season. It only creates more drama, not only for the Calder race, but for the Jackets' search for a #1 center on a team that needs it. 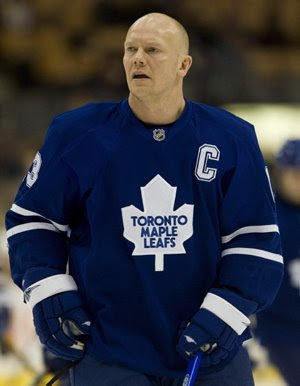 That's right kids, Mats Sundin has signed and it looks like he's keeping his career in Canada. From Quebec to Toronto and now to Vancouver as the stalling Swede has agreed to a deal with the Canucks. So that's it, no more to see here, time to wait on Peter Forsberg. Oh....you want some analysis?? Well.....it's done. Sundin could have saved everyone a little trouble and sanity by signing the deal the Canucks put out there in the summer of two years, $20M, but where's the fun and drama in that?? If this turns out to be the deal that is signed, then I will be a little peeved by it. With Roberto Luongo out of the line-up, defense-first may not be the priority now. With Sundin, the Canucks add more scoring prowess, a big leader in the room, and depending on the length of the deal; could keep the Sedin's in the saddle for a while in the Pacific Northwest. Sure, the latter is a longshot, but at the same time-- can't rule that out. We'll have to see what good will eventually come for it, but for Canucks fans and hockey fans as a whole, this is an early Christmas gift. We can all relax more knowing that this Sundin saga is finally done. Last night, Scott Clemmensen got his seventh win in nine start and Steve Mason got his third win in four starts and hasn't let up more than two goals in those four starts; which has lower his goals-against average to a league low 1.91 and raising his save percentage to .929. Craig Anderson in Florida has seemingly usurped Tomas Vokoun's starters position and won five of his last seven to bring the Panthers marching along, while also in the Southeast; Brent Johnson has regained his form when he had 30 wins back in St. Louis and has shown he can be a solid starter in the league. All four of these names, you'd never suspect they'd be the big stories between the pipes. In terms of Clemmensen, Anderson, and Johnson-- some thought they'd be eternal back-ups while the jury on Mason was still out due to injuries and the fact he played on a subpar defensive team like the Columbus Blue Jackets. While Mason and Clemmensen are in there due to injuries to the incumbent starter, Johnson and Anderson's performances have created some sort of goaltender controversy in their clubs; but so long as their winning, it shouldn't kill chemistry all together. We saw something similar like this last year with Ty Conklin coming on like gangbuster (to use a term from the 1930s) when Marc-Andre Fleury was injured, while you can't say the same thing about Dany Sabourin this year with MAF out due to injury. To a lesser extent, you can throw in Alex Auld and Curtis Sanford in the mix with injury and controversy, which proves how valuable back-ups can been should the starter go down or struggle with their play. You look around the league and see a lot of veteran back-ups being signed like Curtis Joseph, Steve Valiquette and Brian Boucher, who could make a difference should they be thrown into heavy rotation. Even youngsters like Jonas Hiller and Antero Niitymaki can be able to make a difference even though their NHL experience levels aren't up to snuff in most cases; they could still win games if need be. You wonder why some teams, especially in the case of the Calgary Flames, risk the chance having a very young, very inexperienced goalie in their bench. While Curtis McElhinney has a lot of promise, he still may not have what it takes to jump in and carry the workload of that Miikka Kiprusoff. In addition in that, his development could be stiffled by sitting on the bench and not getting playing time, even at the AHL level. We'll have to see what the second half of the season brings and what goalies can bust out a surprise should the starter falter or get injured like Martin Brodeur and Roberto Luongo have this past season, which allowed guys like these to step up into the limelight and get the recognition they have dreamt about while wearing their baseball cap and opening up the gate to the bench. Note to Peter Forsberg-- no. Just stop it. It's not worth it, it's not practical, and in the end-- it'll probably do more bad than good. 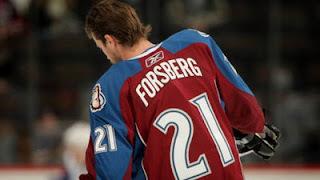 In case you didn't hear-- Peter Forsberg is looking to make a return to the ice in the playoffs, preferably with the Colorado Avalanche. Of course, this is assuming the Avalanche make the playoffs and Forsberg's foot can actually hold up to any kind of skating ability whatsoever. Forsberg has been getting therapy for his foot with electrodes and wore them in his skates last season when he returned to the Avs. However, from that time, there have been more procedures to his right foot, which could cause some concern for his return. Here's the thing though, and this is just me, but I think this could be an awful idea for all involved. First, for the Avs-- there's no need for a distraction when they are trying to scratch and claw to the playoffs as it is; no need to blow a roster spot when you need all the healthy bodies you need. For Forsberg, he's just tainting his legacy every attempt at a comeback he tries. You would think with the history and accolades he has achieved, he'd just call it a day and go enjoy his retirement in a front office position and not try to ruin his foot to the point where he'd have to need a walking aide in order to go on with his life. Plus, with all the rumors of Forsberg coming back last year, we don't need to be inandated with all these reports, especially after the Summer/Autumn/Winter of Sundin we've had. Why are the Swedes always the ones with rumors surrounding them?? Whether it's Forsberg, Sundin, or Fabian Brunnstrom-- they always have heavy rumors around them. Craziness. So, for the sanity of everyone in the hockey world; Peter, Foppa-- please, don't do the "will he/won't he" stuff with us. We were tired of it many times before and we're going to keep getting tired of it every time you try to come back. Just finally end it and go into the sunset with what's left of your memories and pride. Forget the Winter Classic, forget the Ice Wars of 2001-- the IIHF and the German Ice Hockey Association is looking to go big for the opening of the 2010 World Hockey Championships. 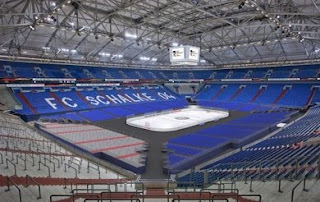 The Germans are going to make an announcement that the opening of the 2010 WHC will take place in Veltins-Arena, home of FC Schalke 04 in the Budaliga. The hope is that the Germans will quall the capacity 75,976; which would overtake the world record of Michigan/Michigan State game in 2001 that had an attendance of 74,554. There's high hopes for the German Organization Committee is hoping for as many as 500,000 spectators for the 56 games with 1,000 journalist covering the event, and 800 million viewers worldwide to take in the event. Now aside from the opener, the other arenas that will hold the event will be the SAP Arena in Mannheim and the Lanxess Arena in Cologne. The IIHF gave pass to the Veltins-Arena since all the WHC games have to be played in an enclosed arena, and luckily for the Germans, the Veltins-Arena has a closeable dome-- hizzah. Now, with the Germans going big by huge, wil the NHL or another league (probably NCAA) decide to go really big. Luckily for the NHL, they have access the the biggest stadiums out there in some hockey towns. Granted-- this is a little bit of a branch off of my "What If" fantasy outdoor match-ups, but they could be plausible. -Beaver Stadium; State College, Pennsylvania (107,282): This would be a perfect opportunity for the Battle of Pennsylvania on the big stage. The seating capacity is plentiful and what better way to spend a day in "Happy Valley" than seeing the Flyers and Penguins beat the crap out of each other?? -Michigan Stadium; Ann Arbor, Michigan (106,201): Sure, this has been done before with a big game in Michigan, but why not put the Red Wings in one of these events?? Oh, wait-- they're doing that at Wrigley. -Ohio Stadium; Columbus, Ohio (102,329): Whether it's the Blue Jackets or The Ohio State University Buckeyes, there could be a solid turn out. It has the weather, the lake effect snow possibility, and big game atmosphere appeal to create a big draw. -Los Angeles Memorial Coliseum; Los Angeles, California (93,607): It's a weather issue, but there's a chance to have a big TV market put out there and display another one of the talented young teams out there in the LA Kings. -Cotton Bowl; Dallas, Texas (92,200): Sure, it's a reach; but if there's something the Stars could pull-off-- this could be the thing. It's a huge venue with plenty of history behind it-- but weather would be the huge factor in all of this....and we know it won't cooperate. -FedEx Field; Landover, Maryland (91,704): The Alex Ovechkin factor would be in full effect for this one, but the only issue is the wacky mid-Atlantic weather at any time of the year that could queer the deal. Yet, if the NHL can make it happen-- they will find a way. I'm sure there's some spare parts from the old Capital Centre still laying around across the road there. One can only dream, and of course the biggest stadiums are in the South or West; which creates the problem of weather-- but still. If the NHL would want to do something bigger than the International games; they'd find a way to do it and make it a huge event. We'll just have to wait and see. Reports out of Vancouver are suggesting that the Calgary Flames are close to moving their AHL affiliate from Moline, Illinois to Abbotsford, BC. For the Flames AHL team, this could become the third move in five seasons. First, the team was reincarnated in 2005 in Omaha, Nebraska, but then relocated to Moline. 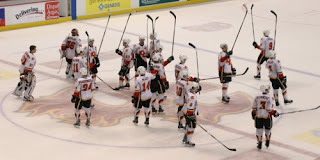 Now, with the rumors of the trip to Abbotsford, it could show the instability in the region that the Flames pick for their AHL home. It seems to be common place as there are affiliation bounces everywhere. 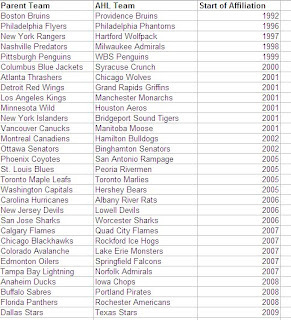 Here's a list of affiliations and length of their affiliation with their parent squad. You'll obviously have to click to enlarge, unless you have great vision, then more power to ya. As you can see, in the past three seasons, 15 affiliations have swapped; 16 if you include the new Dallas Stars affiliate that will start next season. Oddly enough, The Hockey News had an article up about Johnny Boychuk's movement from place to place, not only due to affiliation change, but also due to a team having multiple affilates and filtering through those systems. Since Boychuk's '04-'05 pro debut, he has played on five AHL team, four of those that were under the Colorado Avalanche banner; Hershey, Lowell, Albany, and Lake Erie. Hopefully, Boychuk didn't sign onto any long-term apartment leases. Though many of the teams stay in the same place, but have new affiliations, it could be hell on fans who have to buy new jerseys every year as they change like the tide. It's almost like fans can't even get attached to their favorite players because you never know when their team could up and move to another more profitable market. However, with the turnover rate, odds are they'll get a team in no time since that seems to be the status quo unless a new market pops up; much like in this case of the Flames. That said, with the amount of minor league teams and the popularity of the Quad City market; I'd say fans wouldn't have to wait too long in Moline to get another team and cheer them on....only to wonder in the back of their head when this team could move for a better deal to be had. Nice story out of DC, as Washington Capitals Web editor Brett Leonhardt signed an amateur try-out contract with the Capitals and will be suiting up as the back-up for Brent Johnson, only until Simeon Varlamov gets into the area from San Antonio and takes over for Leonhardt. Now, this shows a couple things. One, it gives hopes to bloggers everywhere that they could be the next to be called upon to suit up for their favorite team. Second, as a former student at Neumann College (only two semesters), it's great to see someone from there make a splash as big as this. It could be only his 15 minutes of fame, but I'm sure for Leonhardt, it'll be a moment that last a lifetime. Thirdly, this could be the first Division III player from the NCAA to suit up for an NHL team. I haven't done the research (there's a shock), so I'm probably wrong-- but still. With Johnson having a bum hip, you never know what could happen with Leonhardt or even if the Caps will let the young stopper be in the game for a little bit to face a shot, then go on his merry way and have that memory to pass onto his grandkids. Either way, I am quite jealous of Leonhardt and hope that he savors every moment of it. John Kreiser shines the spotlight on Pekka Rinne of the Nashville Predators and talks about how his play has allowed him to usurp Dan Ellis as the Predators starter. Rinne, who has been touted as the future in net for the Preds, has picked his spots and made his way through the system to take over the throne in net. It got me thinking about Nashville goaltending history. Outside of Tomas Vokoun and maybe Mike Dunham, it's been a varible crapshoot for the Predators when it comes to goaltenders. Just recently, they've gone from Vokoun leaving via a trade as Chris Mason was deemed good enough to take over the role. That didn't happen, but luckily they got Dan Ellis and he was able to take the reigns and go from there. 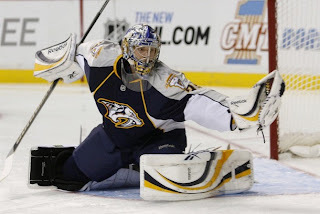 Ellis signed a new deal and his play started to slip which has allowed Rinne to take over. In fact, the Predators have drafted 15 goalies in their history, with Rinne being the only one to truly develop through the system and be successful in making his hype become reality. Others like Brian Finley and Jan Lasak, both who were highly touted at the time, has numerous set-backs and never flourished into the top-notch goalies they were made out to be. However, why would a team draft so many goalies when you can really only have two rostered. In fact, they have five goalies under contract: Ellis, Rinne, Chet Pickard, Mark Dekanich, and Drew MacIntyre; the latter two being the goalies in Milwaukee of the AHL. Though, maybe Nashville is doing with goalies what Tampa is doing with forwards. But, for whatever reason, the Preds are stacked in net. In fact, five goalies have been selected by the Preds in the last three NHL Drafts. Sure, two of the three are in Europe and may not make the trip over the Atlantic, but still-- with a youngster like Rinne in the system ready to go, how can you go about picking goalie after goalie in Draft when you don't know what your future franchise keeper would do on the big stage?? I guess err on the side of caution is the main motto for the Preds, and who could blame them since Vokoun left and the instability in net looms. If you throw enough things against the wall, something is bound to stick. 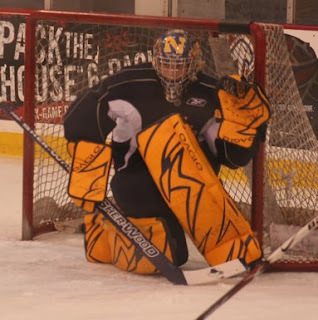 Rinne becomes the first goalie to be developed through the Predators system, which could say something about how they have improved or how shotty their work has been prior to him. Another thing for the Preds, this could be used as a bargaining chip down the road. Should Rinne or someone else stick and the Preds still have guys developing in the system, they could use the excess goalies to trade away and pick up the spots they need in return. It's something that should definitely be tracked through the next couple of seasons, just to see if Rinne could be the long-term answer or short-term replacement until the next guy comes and steals his spot. 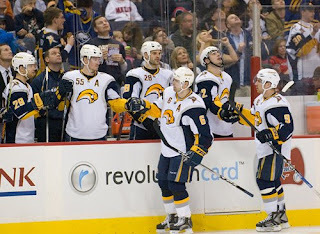 According to unnamed sources, the Buffalo Sabres are quietly on sale. TSN brings up an article from Western New York Hockey magazine that owner Tom Golisano is listening to offers to sell the team from anyone who may be wanting to listen. It also says my favorite wanna-be owner, Jim Balsillie, has been approached by minority owner Larry Quinn. Also in the article, it says that the deal could see a partial schedule of the Sabres playing in Hamilton's Copps Coliseum. Now, Balsillie approached Golisano last December, but was turned down because Golisano didn't want to sell to someone who wanted to move the team. How the economy changes the tune of many people; regardless of their morals. Could the Sabres be the most unstable hockey organizations out there?? You look at the team who was bought by Golisano for $20M in 2003 when the Sabres were on the bankruptcy block. They built up their franchise through the draft, made a successful run in the playoffs for a few seasons and now, they seem to be on the verge of becoming the Montreal Expos of the NHL calling two different countries their home. Though Jim Kelley (a writer very close to the Sabres organization in the past and not the Bills former QB) penned this article-- you may want to wonder why this is coming out all the sudden. I don't think I'd doubt Kelley, what with him being honored numerous times over and being inducted into the Hockey Hall of Fame-- just call it pessimism for the sake of being pessimistic. It's not as if they are floundering, they're 11th in attendance with 18,562 and at 99.3% capacity. Granted, it's a drop off of their 2nd in attendance last season at 19,950; though it could be a tad skewed thanks to the Winter Classic. It's not as if they are doing horrible, as such. They're currently 9th, two points out of a playoff spot. If not for their recent slide losing eight of their last 11, they could be at the top of the Eastern standings right now. Who knows what the motives are, aside from maybe trying to cut some losses for Golisano, whatever they may be. 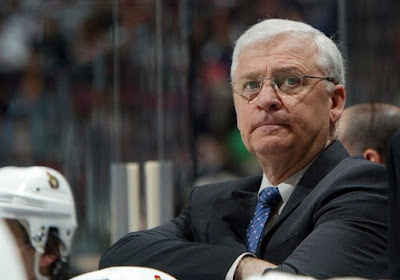 Yet, the thought that Mr. Jim Balsillie was approached by the minorty owner about the whole thing may mean that things are looking up for this man to take over an NHL team. The whole Hamilton split schedule thing could be interesting in terms of whether or not the Toronto Maple Leafs will start bitching and moaning about territorial rights and stuff of that ilk; but this is all hearsay and conjecture at this point. But, whatever is the deal-- should Balsillie actually be in the running, you know Hamilton will probably go from split season to full season in a matter of seasons. Think of what he could do with the team, however, with the wallet open. It may not be like this current ownership who don't seem very willing to pony up to the table with contract renegotiations come about, unless they were pushed to do so (ie: Thomas Vanek). Balsillie could make this team a solid organization if he were to take over, but it wouldn't take much with key guys like Vanek and Ryan Miller locked up for the long term. The funny thing in all of this is that with all the talk and chatter of the Phoenix Coyotes being in trouble, the name that comes up for being on sale is the Sabres. For a team that seems to be in good standing financially and solid fan base, they're now-- alledgedly-- back on sale for the second time in less than a decade. UPDATE 12:15 PM ET: Looks like Larry Quinn is putting out the fires quickly by denying the report of Jim Kelley's in WNY magazine. The hammer fell on Sean Avery, six games worth which is retroactive to Tuesday night-- so technically four games the rest of the time. On top of that, Avery will get anger management so the next tirade he goes on doesn't sound like Andrew Dice Clay in his prime or Michael "Kramer" Richards at the LA Improv. So, that's that, right?? We're done with this, huh?? 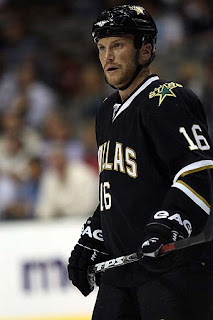 Not so much, because the big thing now is what's going to happen with his status with the Dallas Stars. Are the Stars going to pile-on some more games on top of it to prove a point?? Coach Dave Tippett has already said there's no room for Avery on the club and according to James Duthie, many Stars players are glad to see him gone. 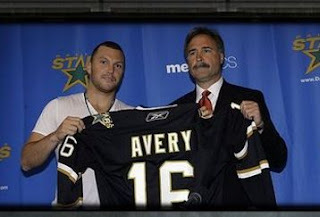 With the writing on the wall in Dallas, is there's a trade avenue for Avery to turn down?? Odds are that he's a toxic commodity that not many teams would take a flier on. While he could be effective on the ice, the circus off the ice could be more than any team could handle, especially this deep into the season. It's one thing to bring in a class guy during the trade deadline to shake up team chemistry, but you may as well just write-off the season if you're interested in Avery. Please note, that by saying that-- it has officially made the Tampa Bay Lightning interested in Avery to become their 358th forward for the year. It seems that the Stars are going to be content with eating up Avery's salary for this year and then buy out his last three years in the off-season, that is assuming they want him gone that badly. That, in-turn, would make him a free agent and then others can pass him up for nothing. Then, without the NHL, what are Avery's options?? With the Manitoba Moose, one of the Stars many AHL affiliates for the season while their AHL affiliate gets set up for next year, has stated they don't want Avery under any circumstances. One has to wonder: if Sean Avery becomes a free agent and doesn't have a gig in the NHL, will there be a minor league team to do the "Veeckian" thing and sign him just to get asses in the seats?? Is there a team in the minors who would risk the sanity of their players, risk the chemistry in the room, and be comfortable with not getting any worse just to get a firestorm of media coverage for signing Avery?? You have to think, if Avery is out in the open looking for a job and there's a team hurting at the gate-- someone will think of the bright idea of bringing him in to get the team name out there and to get some people in the seats. It's not something that you can throw in the garbage, because it's something that very well could possibly happen. Is Europe an option for Avery?? Will he go over there in order to get the hottest fashion trends, whilst playing hockey for some random team with numbers in the team name and dots over the "o"s?? I doubt he'd go over there and I don't think they would want to expose their players to something like that. Only time will tell right now, but for the time being we know this: Avery is suspended for four more games, he is currently a member of the Dallas Stars, and many don't want him in their locker room for one reason or another. The newest ECHL team on the block next season will be the Toledo Walleye and they unveiled their new jerseys recently, and I have to say I'm fairly impressed. The color scheme is great with the baby blue, navy blue, and yellow mixed very well with the colors being accented when needed. The logo itself is original, and while it does look a bit cartoony and unrealistic (when did fish get hands to put into the gloves?? ), it's the minors and it's something that'll sell to anyone. The one thing I'll have to wait and see about is the "fins" underneath the shoulder patches. You really can't judge that until the it's put over top of shoulder pads because then it'll fit like it needs to and maybe give the desired effect that the team wanted. I don't know about you, though-- but the Walleye could be my new favorite ECHL team in logo/jersey combo alone; though the Reading Royals scheme is very slick....but they're affiliated with the Toronto Maple Leafs, so I'm not fond of them anymore. You're thinking to yourself, "Hey stupid, those are two different sports. What kind of idiot are you??" You'd be correct in asking that, but it's something that many don't understand is out there and probably have prop bets on in one way or another. Basically, the Cy Young Award is one that goes out to a player who has way more goals than he does assists, much like a Cy Young pitcher should have way more wins than losses. The Green Jacket goes to the player who has the league's worst plus/minus ranking, much like a golfer at the Masters would have the lowest score to win....you guessed it-- the Green Jacket. Right now, Thomas Vanek is in the league with 13 more goals than assists (18g, 5a), while Jeff Carter is +11 in goals (18g, 7a) and David Booth is +10 in goals (12g, 2a), all heading into Thursday's games. 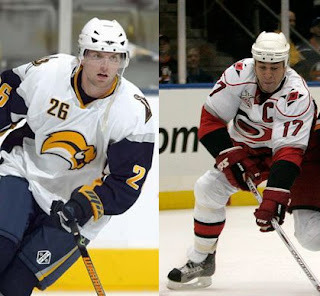 Sadly, one of the best face-off men in the history of the NHL is in the low spot with Rod Brind'Amour racking up a -18 going into Thursday night's games. Three Blues are in the top-5, though on, Andy McDonald, it out with an injury. A good buddy of mine, Patrick Hoffman, who has does plenty around these interwebs, did an interview with me for his blog over at Kukla's Korner. Oddly enough, it wasn't to be a janitor at the KK HQ....I got passed up for that year's ago. No, it was about FOHS and some background info. Luckily, it wasn't anything too discriminating that can be used against me. The Pants Story does that enough already. First, Let me preface this by saying that as an agitator on the ice, I believe Sean Avery is one of the best out there right now. He has all the tools to be a great player and decent scorer, but yet his mouth is what gets him the attention in the world and not his play on the ice. Now, onto the comments that got him suspended indefinitely. My thing with what he said is that he needs to keep the personal life out of all of this, especially when he wasn't questioned about the whole thing. It seems that he really has a big bout of jealousy in regards to his ex-girl Elisha Cuthbert, especially since she has been linked to Calgary Flames' defenseman Dion Phaneuf. It wasn't enough people were prepping for the Avery-Jarome Iginla confrontation after Avery called Iginla "boring", then we had this whole thing with Phaneuf brewing. However, kudos to the NHL for suspending him. Granted, the indefinite side of things is crap, but I think it was only due to the fact that they couldn't have reviewed it and given a solid number in the time they were given. Avery's commentary is not what the NHL needs, and while some would argue that this is Gary Bettman's way of shutting down someone who could draw attention to the league.....but it's not the right attention they would want. Fans are upset that the NHL stopped a possible huge beating of the NHL's most hated player, but that would be more negative attention the league would get and not need. It's a very telling sign when many of Avery's teammates are SUPPORTING the NHL's decision. They don't seem to like him very much and what happens during the first game he was out?? They go out and win 3-1. Could Avery be the thing that was breaking apart the Stars?? If they go on a huge winning streak with Avery out-- will he be the blame for the early season disaster?? With three years left on his contract at $4M left on each year, it'll be hard to buy him out, but if they get better-- they may have to spend the money to do that. We'll have to wait and see what the future holds for Avery, but who knows what could have been done had he kept his mouth shut and let his game do the talking for him. 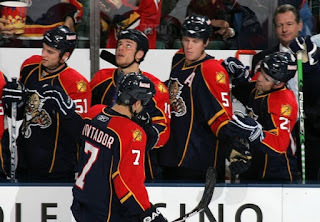 In the December 1st edition of The Hockey News, David J. Neal has a great piece about why the Florida Panthers are struggling. His main points are the slow starts and the lack of getting to the playoffs as the fans have been staying away in Miami in droves. "When fans in Calgary or Edmonton or Detroit or Boston or Chicago don't want to pony up the equivalent of six table dances at Chez Paree to sit through hockey with no hope, they've been considered discerning fans or saluted for complaining via their absence. When fans in a warm-weather city don't want to pay big bank for repeatedly lousy results, they're philistines in a bad hockey market." Neal makes a great point-- why is there this double standard when it comes to any team below the Mason-Dixon line?? From the Predators to the Panthers to the Thrashers and to the Coyotes, whenever teams are in trouble in the south-- the argument is that it's not a hockey market comes up ten-fold. It's not because the team is crappy and people don't want to want to pay for a losing effort; it's because it's only gets down to 50f as a low in January on most nights and that shouldn't happen if you want a hockey team. In the same publication, The Hockey News talks about the revival of the Blackhawks and how great it is to have them back in the playoff fold again. Because it's an original six team, they get this publicity, but you can bet that if the Panthers next season win the Stanley Cup; no one would bat an eye or do a piece about them going through the tough times and surviving many talks about the team moving from Miami to elsewhere. More than likely, you'd probably get people (who claim to be traditionalist) bitching and complaining how much of a travesty that the Stanley Cup is residing on the beach and not in a place where hockey has been played for generations upon generations. But, it's a vicious circle for teams. Fans are showing up because they aren't successful, so the owners aren't making the money. The owners aren't making money so they can't get or hold onto the quality players to make the team successful. Because the players aren't there-- the team loses and fans don't show up. As we all know though, if you want fans-- you have to be successful and stay successful to keep a high fanbase. If you put a team like the Red Wings or the Canadiens in a place like Miami-- you'd probably get a booming fanbase. Put the ownership group, front office, and roster on the ice in Miami and you'll have people coming out to see the team and it would be considered a successful organization.....regardless of the location. You wouldn't have the arguement that they shouldn't be in the league because it's a warm climate, or at least you'd hope not. That being said-- the Panthers and the Thrashers are my top two teams of being relocation. The Panthers is due to the attendance and the ownership group being in disarray and the Thrashers has to do with the ownership group as well, who has been having some in-fighting for quite a while, I do believe. Odd how the Southern teams have the awful ownership issues and makes people talk about why they shouldn't be in the league.